The Friends of the South County Library was organized by then Branch Manager, Deborah Schlanser in September, 1992. There were about 15 original members (compare with 490 current members). Prior to the Friends group being formed the Women’s Club of Arroyo Grande provided support and volunteers to the Library. Dave Wilcox was elected the first President and Debbie Saurbrier, Vice President. Other important members included Ian Pilling who took on the job of Newsletter editor and Happy and Leighton Pratt who accepted the positions of Book Sales chairpersons. 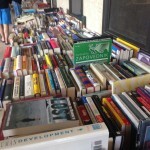 The very first book sale took place in November 1992 and raised a princely sum of $444.16. The Pratts resigned in 1995 after garnering $7500 during 14 book sales. Significant contributions were also made by Pat Conniver who became the first magazine/book chairperson and Anne Pilling one of the original founders and volunteers. Initial fundraisers for the Friends included, of course, book sales, but also T-shirt sales. Several decades later, the Friends still rely on Book Sale, as well as book/magazine sales as their primary income. In 2016, in conjunction with the Historical Society, the Friends produced and sold an historic calendar as their annual fundraiser. In February, 2007 the Friends sponsored their first Website (www.foscl.net)and soon after began their first involvement with Better World Books. July 10, 2008, the organization became the Friends of the Arroyo Grande Library (prior to that the name was the Friends of the South County Library). There have been other changes in the Library and organization over the past 25 years, but the goal of FOTAGL is still to provide monetary and volunteer support to our wonderful library. All the volunteers, then and now, are dedicated to making our library a place the public can come to gain knowledge, be entertained and enjoy the joy of books and now electronic information. There are several current members that have personally experienced the “history” of the organization. Former, but still current members of the Friends include: Kim Elston (now Secretary, Past President), Donna Kimber (now Treasurer, former Membership), Kersti Lasiewski (now President), Kent Unsworth (long time Book Sale Chair), Mary Boyle (now newsletter editor extraordinaire), and Sandra Mason (now Volunteer Coordinator). Because we now earn more money from our book/magazine rack, our book sales, special fundraisers (like our historic calendar sale) and internet book sales, we are able to donate much more money (over $50,000 in 2016) to the AG Library. We are now able, in addition to purchasing books, magazines, CDs and DVDs, to purchase computers, furniture and supplies as well as providing funds to support both adult and children’s programming. We always have volunteer opportunities so please think about giving your time and support to our group. It is so meaningful and satisfying. We are celebrating our 25th year of support for the AG Library!